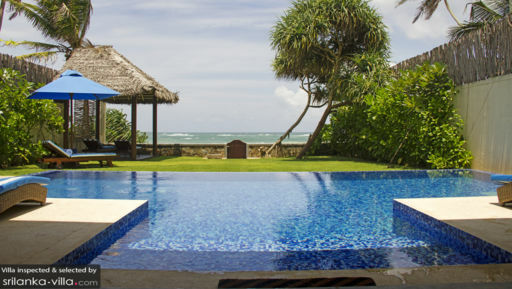 Nestled by the golden sandy beaches of Habaraduwa, just a few kilometers away from the more touristic Galle town, Villa Nilaya is aptly named in the ancient Indian language as a peaceful “abode” for any traveler to relax and enjoy the beauty of the Indian Ocean. The cosy two bedroom Villa Nilaya is an ideal getaway for a small family or a couple looking for a private beach holiday. Villa Nilaya boasts two large bedrooms on its first floor with four poster beds and colourful turquoise and white furnishings with even more colourful ensuite bathrooms. Just beyond the dining area is the pool with its blue mosaics tiles overlooking the ocean. The garden is landscaped in a manner which invites its guests to move from Villa Nilaya to the sandy beaches beyond the little brown door at the edge of the garden which opens to the ocean. The entire ground floor of Villa Nilaya is dedicated to an open living space. 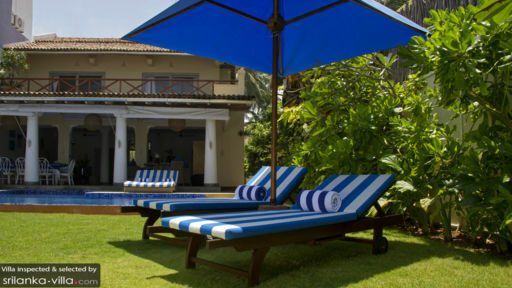 With a sitting area well equipped with comfortable cushions and large couches leading the way to the dining area which is overlooking the pool and the ocean. The blue and white furnishings and decor in the living spaces is a tasteful mélange of typical Greek colours with an Asian style. Fully staffed with daily housekeeping, bellboy, concierge and a dedicated chef, everyone at Villa Nilaya is ready and waiting to welcome its guests for a perfect holiday experience. The chef is ready to create any dish to suite your taste, but if guests wish to cook something for themselves, they can do so in the fully equipped gourmet kitchen. 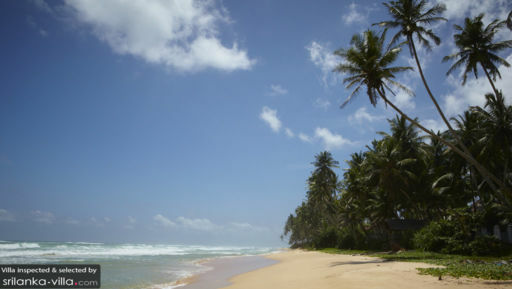 Just a 15 minute drive from the historic World Heritage Site of Galle fort, Villa Nilaya provides the perfect location for a private beach getaway with easy access to many sight-seeing opportunities including the sea-turtle hatchery in Koggala, boat rides on the Koggala lagoon and snorkeling in the Unawatuna bay, all just a few kilometers away. We loved everything about the house. The pool and living room spaces were amazing, the staff and cleanliness spectacular, it was probably our best family holiday! We would highly recommend this villa to everyone. We thoroughly enjoyed our stay at Villa Nilaya- The Villa is comfortable, well-organized. tastefully decorated. The service was attentive and hospitable. The beach is fantastic! We hope to be back soon.